Cast aluminum plates are made to last a lifetime. Letters, logos, and border are raised with a choice of two finishes: white reflective or standard gold. Choose any one of 10 different baked enamel background colors. UP-10 bracket- 10"x 2 3/8" heavy duty cast base has concave back; will fit flat wall, post or round poles. It has four 5/16" holes for screws or bolts and four grooves for metal straps. Uses 1" aluminum tubing for out arm; finished with French fleur-de-lis ornament. UP-7 brackets- 7"x 2 3/8" heavy duty cast base has concave back; will fit flat wall, post or round poles. It has two 5/16" holes for screws or bolts and two grooves for metal straps. 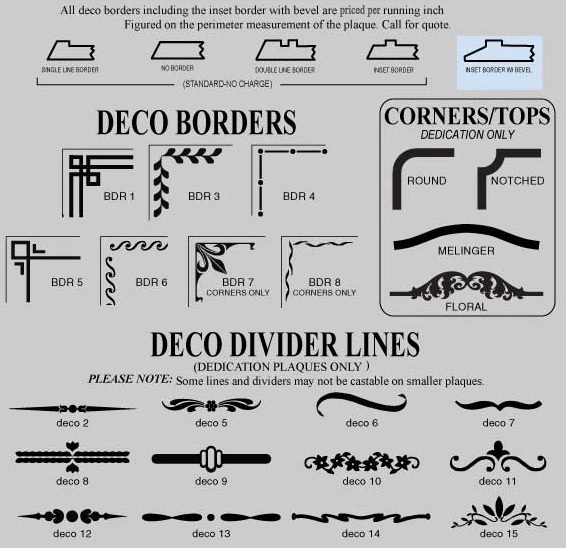 Uses 3/4" x 1/2" solid aluminum stock for out arm; finished with French fleur-de-lis ornament. AP-5 Series comes with UP-10 bracket. 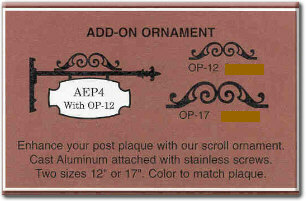 All other post plaques come with UP-7 brackets. One logo available at no charge if selected from our logo pages. Custom logos from your camera-ready artwork are made with an extra charge.